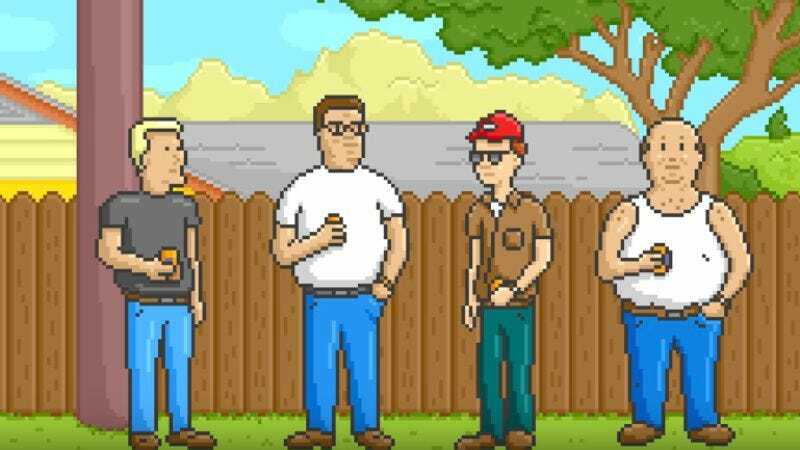 Hank Hill never shared his son’s fondness for the Nintendo Game Boy, but even he would have to admit that this pixel art rendition of the King Of The Hill opening is impressive. Created by Mauri Helme, the animation is a seemingly perfect frame-by-frame recreation of the original version, complete with a chiptune cover of the theme song. Plus, just to show off a little, Helme added a little montage at the end that gives another look at some of the characters and adds in a few that aren’t included in the normal opening—like Joseph, Cotton, Connie, and Tom Petty’s Lucky. Our favorite part, though, is the way the pixel Hank blinks at the end after the title comes up. That’s exactly the sort of thing Sonic The Hedgehog used to do back in the Sega Genesis days, so it gives this thing an appropriately retro video game feel. Helme’s animation is below, along with the original intro.